Central Connecticut State RB Aaron Dawson, Eastern Washington QB Eric Barriere, Wofford WR T.J. Luther, James Madison LB Dimitri Holloway and the Colgate Raider defense have been selected as the College Sports Journal FCS Football Players of the week ending October 29th 2018. Dawson produced an unprecedented second-half showing en-route to breaking the NEC’s single-game rushing record during a 49-24 victory over Wagner. 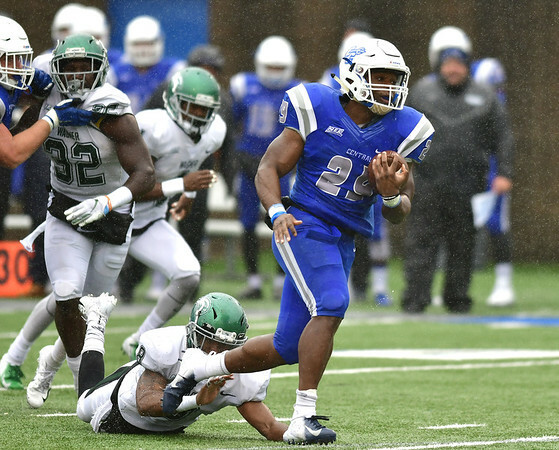 Setting a NCAA Division I record for rush yards in one half, the burly CCSU running back carried 15 times for 308 yards over the final 30:00. For the game, Dawson averaged 15.0 yards per rush while totaling an all-time conference single-game high 361 yards and five touchdowns. The yardage total surpassed the prior NEC record (332) that was set by former CCSU All-American Justise Hairston in 2006. He ran for 197 yards during the final period, setting the DI FCS mark for most rush yards in a single quarter. Barriere accounted for a career-high 396 yards of total offense – 266 in the first half alone – in Eastern’s 92nd-Annual Homecoming Game. 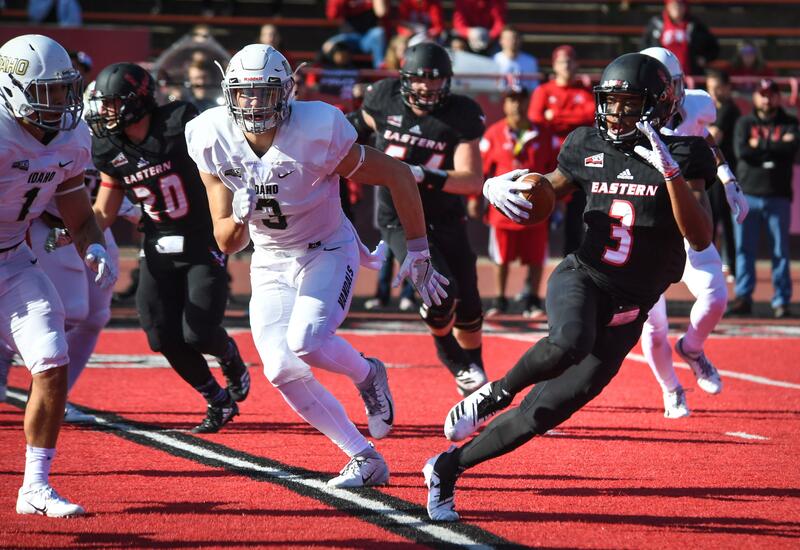 Eastern finished with 546 yards off offense in the school’s first-ever victory over Idaho in Cheney, having lost three previous meetings at Roos Field (formerly Woodward Field) against the Vandals. The Eagles had a near-perfect first half, scoring 31 points and having a 364-129 advantage in total offense. Barriere opened the scoring with a 48-yard touchdown run, and also passed 22 yards to Henderson Belk and 7 yards to Dre’ Sonte Dorton for scores. The freshman from Arcadia, Florida had only two receptions in a 42-21 win for Wofford over Mercer, but they were huge. On the first play of the second quarter, QB Miller Mosley found Luther for a 71-yard touchdown to give Terriers had a 7-0 lead at the 14:49 mark. In the third quarter,a 50-yard touchdown pass from QB Joe Newman to T.J. Luther pushed the lead to 28-7 at the 2:44 mark. It marked the first 100+ receiving game for the Terriers since Jeff Ashley had 111 against Georgia Southern in 2013. It is only the 8th 100+ receiving game for Wofford since 2001. In JMU’s 13-10 win against 15th-ranked Stony Brook, Holloway recorded a career-high 18 tackles, including 2.0 tackles for loss. He spearheaded a JMU defense that held SBU to only 120 total yards and no points in the second half. That also included holding the visitors to a 1-of-8 mark on third down. The Seawolves had scored at least 28 points against all FCS foes entering that game. 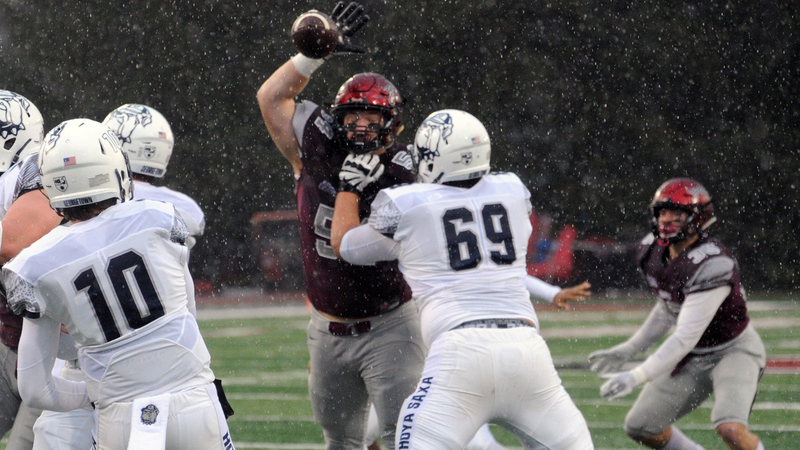 The Raiders pitched their fourth shutout in the last five games and Colgate took control of the Patriot League race with a 38-0 triumph over Georgetown here Saturday. The four shutouts in one season are the most since the 1966 Raiders had four. Colgate limited Georgetown to just 36 yards of total offense on 48 plays. The Hoyas in the second half gained 6 total yards. They were credited for the game with 28 rushing attempts for minus-12 yards. Only Towson’s minus-38 in 1999 was lower on the all-time Colgate defensive rushing chart. The total offense number of 36 was the fourth-lowest in program history.